Skyhigh’s Office 365 Cloud Adoption and Risk report shows that the average enterprise uploads 1.37TB of data across SharePoint, OneDrive, and Yammer each month, 17.4% of which is sensitive. With Office 365 use exploding and vast volumes of data headed to the cloud, IT Security teams are working to determine how they can enforce security, compliance, and governance policies seamlessly for O365. 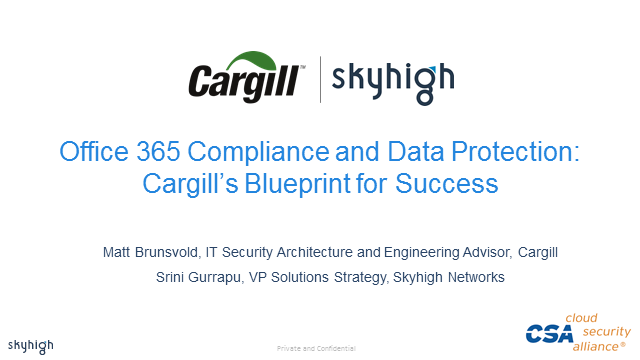 Cargill has been at the forefront of this movement, and in this webinar Matt Brunsvold, Infrastructure Security Architecture and Engineering Advisor at Cargill will share the findings of his research into Microsoft Office 365 controls and how they’re leveraging a Cloud Access Security Broker (CASB) to achieve comprehensive data protection.